When I was a kid, we had one Chinese restaurant in the small Louisiana town in which I grew up. It was a nice restaurant. The food was good. It wasn't fast food, and it wasn't an all-you-can-eat buffet. These days there's a Chinese restaurant in every strip mall. Most are buffets. Mostly mediocre food. It seems as if there's so much potential, but so very little followthrough in these kinds of places. Really, it's difficult to find even a really good Asian restaurant anymore because of all the competitions of the strip mall variety. I've seen very good Chinese restaurants close their doors because of the cheap Chinese buffet two blocks down cutting into their business. But there are a few good ones still out there. And I tend to judge any ethnic restaurant of any kind by whether or not I'm the minority nationality when I'm there. If I find that I'm one of the few Westerners in the place, I can generally always expect the food to be not just authentic, but very good as well. However, as is the case nearly every time I eat out--even at good restaurants--I inevitably think to myself, I could make this taste even better if I made it myself at home. So shortly after I got my second wok (reviewed last May), I decided I wanted a Chinese cookbook. Well, not exactly a fully authentic mainland Chinese cookbook, but more of the kind that represented the American Chinese cuisine I was used to. 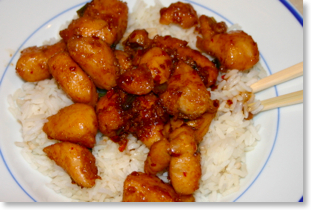 Yes, I know, I know, General Tso's Chicken was probably never made in China. But, hey, let me start with what I'm familiar and then I'll later branch out. In my quest for an American Chinese cookbook, I settled on The Everything Chinese Cookbook by Rhonda Lauret Parkinson. No, Parkinson is not Asian herself, but she's spent a good bit of time in Asian circles and has studied the cuisine. For an American, she knows her stuff. I was already familiar with her egg drop soup, which I featured in the earlier review of the cast iron wok. So I figured I'd give her book a try, too. 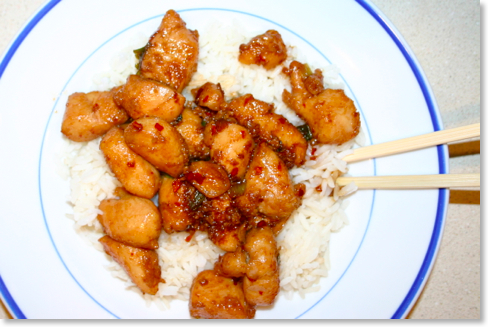 The General Tso's Chicken featured here was good, but I think it could be improved upon. I'm going to present Peterson's recipe pretty much as it is in her book (with the addition of my photographs) and then add some comments at the end. You'll want to especially pay attention to these parting thoughts because they might help you make this dish even better if you decide to make it. Wok (I used a Lodge cast iron wok . Any carbon steel wok will work just as well. You could even substitute a Dutch oven, remember what A. D. Livingston said: "If you've got a Dutch oven, you don't need no damn wok!" Cut the chicken into cubes. Mix in the soy sauce, 2 teaspoons of the rice wine, white pepper, and the cornstarch, adding the cornstarch last. Marinate the chicken for 30 minutes. Combined the dark soy sauce, sugar, sesame oil and 1 teaspoon rice wine. Set aside. Cut the red chiles in half and remove the seeds. Chop and set aside. 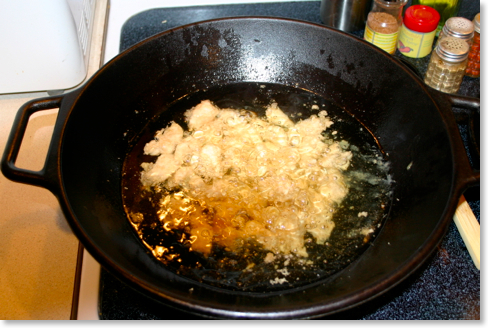 Heat the oil to 350° F. When the oil is hot, add the chicken cubes and deep-fry until they are lightly browned. Remove from the wok and drain on paper towels. 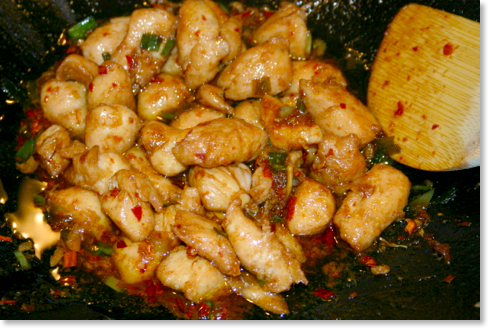 Raise the temperature of the wok to 400° F. Deep-fry the chicken a second time briefly, until the chicken turns a golden brown. Remove from the wok and drain on paper towels. 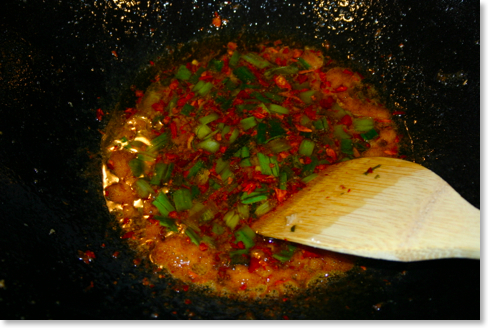 Drain the wok, leaving 2 tablespoons of oil for stir-frying. 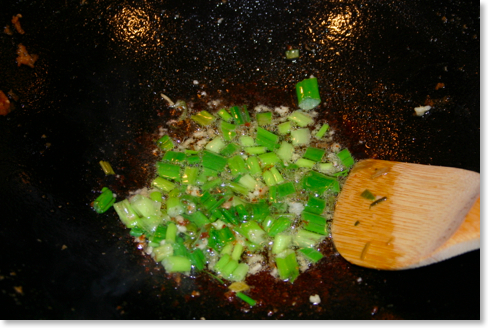 When the oil is hot, add the garlic, ginger, and green onions. Stir fry briefly until aromatic. Add the chiles and cook for 1 minute. Add the sauce in the middle of the wok and bring it to a boil. Add the chicken and mix through. Double the recipe. Kathy and I have been paying close attention to portion size lately. The recipe says that this makes four servings. This is what we were hoping for since we usually like to take leftovers for lunch the next day. This was realistically only two portions--even when trying to keep portions withing a reasonable range. The entire result would equal the average General Tso's ordered from a menu at most Chinese restaurants. I used four cups of oil for the frying. I believe this would be enough even if two pounds of chicken were cooked. Use honey instead of sugar. I mean, why not? Honey would give a better, more natural flavor. Watch your peppers. The recipe calls for six dried chile peppers. Our dish was very hot, and I was very careful to remove the seeds. Therefore, I'd scale it down to at least four peppers, and maybe even two for mixed company. The dish is a bit salty. Mixing it with a bit of rice helps. Most of the salt comes from the soy sauce, so compare sodium levels if you have access to different kinds of soy sauce.